In a rather grudgingly admiring review of this set, which is being issued to mark the tercentenary of Gluck’s birth, the music critic of a major broadsheet called this recording “a wasted opportunity”. The claim was that “Wagner's Iphigenia is just not as good as Gluck's, a new recording of which would have been infinitely preferable”, insofar as this follows the hybrid score of Wagner’s arrangement of the opera set to his own translation and first performed in Dresden in 1847. There is, however, a long tradition of “Iphigénie en Aulide” being performed in Germany in Wagner’s version as “Iphigenie” – or, sometimes, as here, “Iphigenia” – in Aulis. A young Otto Klemperer was inspired by hearing Gustav Mahler own staging and conducting of it in 1907. There are only four recordings in the catalogue of this Wagner “over-painting” of Gluck’s score, dating back to excerpts of a live performance conducted by Leopold Ludwig in 1942. The other three are live or radio broadcasts and for the most recent of those, we must go back to 1972 for a performance conducted by Karl Eichhorn with a starry cast including Anna Moffo, Dietrich Fischer-Dieskau, Trudeliese Schmidt, Ludovic Spiess, Thomas Stewart, Bernd Weikl and Arleen Augér. Unlike this, new issue, none of those provides the complete score, so we are hardly overburdened with recordings and there must be room for one as good as this. The original French version was first performed in 1774 and revised by Gluck in 1775 to introduce the goddess Diana in person to absolve Agamemnon and permit Iphigenia and Achilles to marry. No doubt this ending would have scandalised authorial plot sources Euripides and Racine; Gluck himself dismissed the dancing in the wedding ceremony as “capering about” and indeed in the sequel he reverts to the illogical non sequitur of Iphigenia’s still being a virgin; clearly he was exasperated by the need to provide a “happy ending” to pander to the taste of the French court. If you want to hear that first, authentic turn to John Eliot Gardiner’s superb 1987 recording headed by José van Dam’s noble Agamemnon. However, Wagner rewrote the ending to conform to his own aesthetic philosophy, following neither tragic nor comedic conventions but instead providing a logical conclusion to his depiction of Iphigenia’s dilemma. Rather like Senta, Iphigenia becomes less of a victim and more a symbol of transfiguration through self-abnegation, although instead of sacrificing herself on the altar or devoting herself to Achilles in marriage, she is granted an apotheosis, Semele-style, whereby Artemis (Diana) whisks her off to be her eternal acolyte in some unspecified ethereal location. Wagner’s libretto is in fact rather closer to Euripides than Racine and he echoes Berlioz’s “Les troyens” and his “Tannhäuser” (“Nach Rom!”), premiered two years earlier, by having Agamemnon, Achilles and all proclaim, “Nach Troja!” in an heroic peroration. The extent of Wagner’s interference has led some critics and academics to consider this adaptation of Gluck to constitute essentially a new work, although only about 10% of the music is newly written by Wagner. He was of course a great admirer of Gluck, even if he did not totally understand him, and certainly “Iphigenia” is the opera amongst Gluck’s oeuvre which most readily lent itself to accommodating Wagner’s own ideas about dramaturgy. He simplifies and tightens up the plot by deleting the ballet and three minor characters, and virtually eliminating Patroclus, thereby concentrating on Iphigenia’s psychomachia. Although about a quarter of the score is jettisoned, he then wrote link passages to effect a kind of “through-composed” impression whereby recitative and aria are merged. He re-wrote roles to accommodate the tessituras of different voice categories – thus Agamemnon is no longer a lyric baritone but a bass-baritone and the haut-contre tenor Achilles for whom Gluck wrote becomes a dramatic tenor. He re-scored virtually every bar, thickening and stiffening textures by doubling the violas, enhancing the woodwind, timpani and the brass lines and constantly adding horns. The result is not uniformly felicitous: the extra horns in the overture can sound overbearing and bombastic in the context of Gluck’s stately elegance and at times his translation does not always sit neatly on the music, German having too many consonants to crowd into Gluck’s melodic line. Broadly speaking, however, what we hear is Gluck’s melodies and harmonies adapted to Wagner’s manner and orchestration, which are often reminiscent of the three works written during his seven years in Dresden: “Der fliegende Holländer” (1843); “Tannhäuser” (1845) and “Lohengrin” (premiered in Weimar in 1850, after he had fled). Christoph Spering is one of a handful of Historically Aware conductors whose work I invariably find interesting and usually admire; the others include Philippe Herreweghe and Nikolaus Harnoncourt. The booklet includes a transcription of an informative and stimulating conversation between him and musicologist editor Dr. Norbert Bolín, to which I am indebted for help in writing this review. For this recording, Spering adopts a very slightly lower than modern pitch of 437 Hz and deliberately chose singers with large, dramatic voices, presumably to reflect Wagner’s intentions and match his beefed-up orchestration. In general, his two leading ladies are superior to the male singers: both have vibratos which can be rather too pronounced but their big, vibrant voices convey the drama and tension of their plights. Camilla Nylund makes a lovely job of Iphigenia’s beautiful aria “Bald von Fürchten” which opens Act II and Michelle Breedt’s Klytämnestra is compelling in the depth of her maternal feeling. A word of praise, too, for the silvery soprano of aptly named Mirjam Engel, who makes the most of her brief appearance as the “dea ex machina”. I am less impressed by the sturdy but rather ordinary Agamemnon and Kalchas both of whom lack glamour of tone, especially when compared with the sublime van Dam for Gardiner; how I miss the soaring nobility of his opening “Diane impitoyable” for Gardiner compared with the prosaic “O Artemis, Erzürnte!” of Oliver Zwarg. Zwarg’s bass lacks steadiness and legato in his early aria “Kann vom Vater” and in his big number at the end of Act II the top of his voice lacks ease; the tone thins and dries out too readily. Christian Elsner has turned into a Heldentenor in the ten years since he recorded “Das Lied von der Erde” with Fischer-Dieskau (a previously celebrated, young Agamemnon in 1951 for Arthur Rother) conducting. As written by Wagner, Achilles is a very tricky part; indeed, Elsner is on record as saying that he would be reluctant to perform it on stage, as it alternates so between lyrical passages and heroic declamation. There are certainly moments of clumsiness in his singing and he struggles with his Third Act aria, “Der Priester”, but his weight of voice is elsewhere appropriate. Spering’s chorus and orchestra, both founded by him in the 80’s, are terrific; you have only to listen to the opening of Act II to hear their quality. His conducting is excellent, steering the line between the polar extremes of tempi for which Wagner’s own conducting was criticised without sacrificing tension. This recording ultimately derives from a German radio production in April last year and Spering’s experience with the music shows. As a bonus, we are given the concert version of the overture which otherwise segues straight into Agamemnon’s opening lament. I first heard this wonderful music in Klemperer’s majestic, stately account. Impressive as that is, Klemperer lingers over its cadences to elongate the timing to eleven and half minutes, whereas Spering more reasonably shaves three minutes off that without sacrificing grandeur. A German libretto only is provided. I would urge all admirers of both Gluck and Wagner to acquire this recording for both its historical interest and intrinsic musicality; purists may revert to the French version. 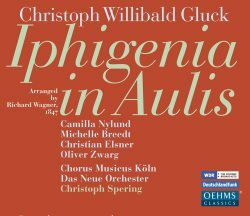 In this, the anniversary of his birth, there has so far been rather a paucity of tributes to Gluck but this Wagner version will be performed at the Internationale Gluck Opern Festspiele as “Iphigenie in Aulis” in July 2014, at the Staatstheater Nürnberg Schauspielhaus, with Oliver Zwarg reprising his role as Agamemnon.